Company intranets have changed and evolved over the years. From its origins as a simple document management platform to the extensive business collaboration system it is today, intranet continues to adapt and grow to meet the needs of modern businesses. Intranets benefit organizations by increasing productivity, efficiency, and employee engagement, and will always be important for essential company-wide communication But if employees are going to truly succeed, they need a little bit more. Employees thrive and work most effectively when they have access to both top-down intranet company communication and peer-to-peer group collaboration. Thankfully, that’s where MangoApps Groups comes in. In this article, we’ll take a look at how MangoApps Groups work, and the benefits they offer to any industry. 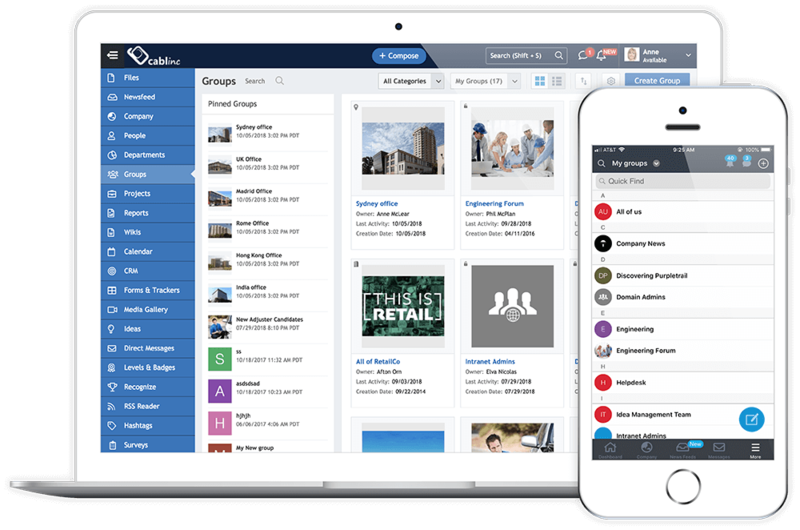 MangoApps Groups provide a space for similar users to work together and share information. While it might seem easy to just arrange groups based on the existing hierarchy or organization chart, that might not always be the only or even the best answer. It is important to plan and implement groups by first identifying user roles. We’ve outlined some of the most common group user roles below. Purpose centered groups are created for users that work together to achieve a common purpose. This could be users that are part of the same department or team, members of a committee, or any other group of people who regularly collaborate and work together to accomplish specific goals. Expert groups are designed for users that share common expertise or similar work experience. This could include industry experts across the organization, onboarding groups for new employees, or users with similar roles throughout or across departments. Common interest groups are the perfect place for employees with similar hobbies and interests to come together, discuss ideas and get to know each other. While they might not always be specifically work related, groups like office sports team, company book clubs, and more, encourage engagement and healthy office culture at both a local and organizational level. Groups centered around events are designed to help users organize, discuss and coordinate important activities. These could be reoccurring events like meetings or project updates, or one time occasions like holiday parties or corporate activities. 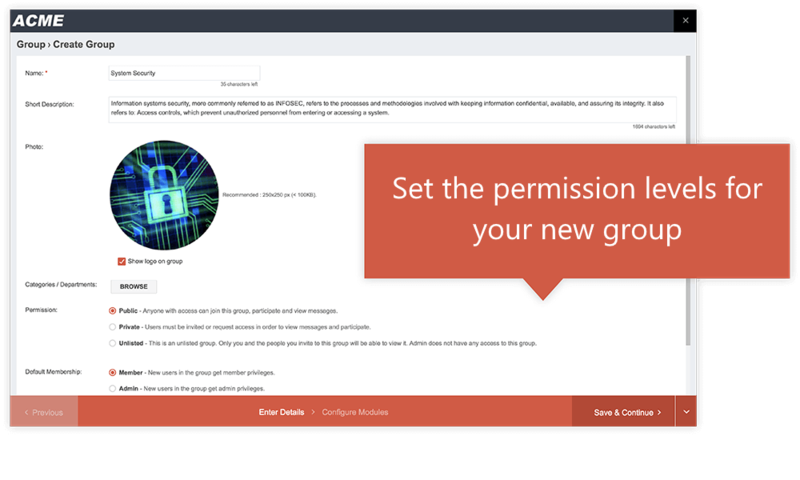 MangoApps Groups make communication even easier by allowing group leaders to set specific permission levels. Groups can be designated as public, private or unlisted, ensuring confidential or sensitive information is kept safe and secure. Group permission levels are established when a group is created but they can also be changed or edited at any time. Public groups are considered open access. Anyone can join a public group, contribute to its content, or view its activities. Some public groups such as IT support or internal learning opportunities, may include all company members. Other public groups may include a company movie club or a local hiking group, where anyone interested is welcome to participate. Private group listings can be seen by anyone, but users can not become members without being accepted by a group admin. Users can request group access or be invited to join. Only accepted members can participate with the group or see its contents. Private groups are often department, skill or team specific. Their goals and responsibilities are generally well known but their unique content may be sensitive or confidential. Unlisted groups are only visible to the group creator and invited group members. Users can only see these groups and their content after accepting a group invitation. Unlisted groups are ideal for particularly sensitive information that group admin may not want to disclose to the organization as a whole. Once you’ve determined your group’s purpose and permission level, it’s time to start implementing tools for success. We’ve outlined a few ideas and best practice techniques to get the most out of your group experience. Defining the roles and responsibilities users play within a team early on is critical to its long term success. Well defined roles help users understand who is responsible for each element of communication, who will resolve conflicts, and how each user fits into the team as a whole. As a result, defined roles and responsibilities also reduce many common communication setbacks such as lack of accountability or ownership, disengaged users, or confusion from your team. A successful group is centered around its users and their overall success. Establishing group admins and other leaders right away will help all users interact better together and communicate more effectively. In order to create and maintain a successful group, it needs to contain the right people. With MangoApps Groups you can invite individual group members by selecting their names or you can invite users in bulk with a CSV file. 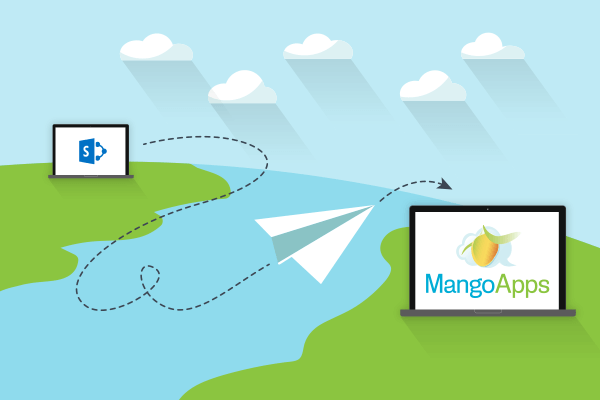 MangoApps also allows you to invite external or guest users, making it easy to keep everyone in the loop. Admins and designated users can also invite, add, or remove individuals at any time, ensuring the team is always up-to-date. Individual users can also choose to leave a group at any time. Teams are made up of a wide variety of individuals with different skills, backgrounds, experiences, and opinions. As those different individuals work and collaborate together, great ideas are born. Make sure your groups engage in helpful, supportive and meaningful conversation. Encourage everyone to participate and contribute to the group’s overall success. MangoApps Groups help streamline communication and simplify the collaboration process, but even the best tools can only be useful when each team member is committed to long term success! MangoApps is built around the idea that customization leads to progress and success. So of course groups should be tailored for their unique needs. Group admins can choose from a wide variety of modules and features to find the best possible tools. By enabling and disabling specific features, groups users are able to access the resources they need without being distracted or overwhelmed. Some of the most popular MangoApps Groups modules and features include: news feeds, files, wikis, calendars, chats, and more. MangoApps Groups is the perfect tool to help enhance communication within any organization. From company wide communities to local teams, groups can be customized for every need. 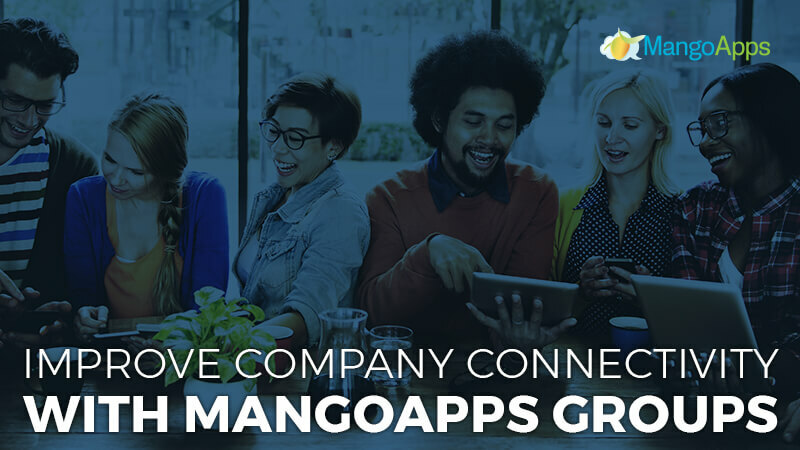 To learn more about MangoApps Groups or any of the other ways MangoApps helps companies improve and excel, contact us or schedule a personalized demo today.